Emerald is the most artistic Bledsoe sister. She doesn’t sit in a corner and paint all day. What I mean by her artistry is that she shows her creative expression through the beauty of her sewing and her hairdressing skills. Her quilt creations strike the eye the moment someone steps foot into the Bledsoe house. In between her sewing dresses for her sisters from a very early age, Emerald stays busy by creating beautiful quilts from the worn out scraps around the Bledsoe home. 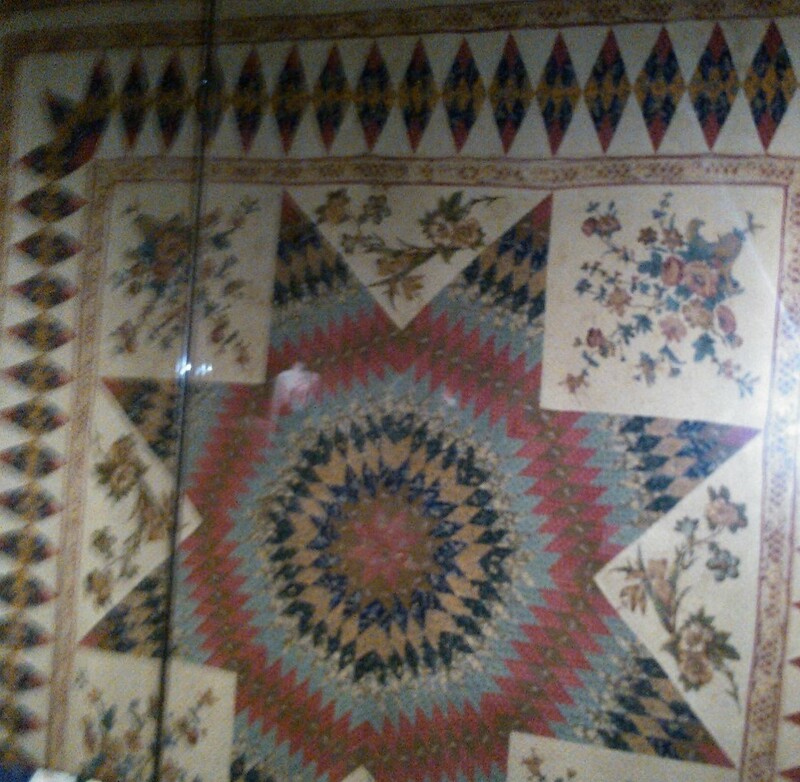 A picture of a quilt on display at The Charleston Museum. The Gee’s Bend quilts are much more free form than this one. Emerald’s character originates from two places. One is from Alice Walker’s title essay in her phenomenal reflections, In Search of Our Mother’s Gardens. In the title essay, Walker talks about the ways that her African American female ancestors managed to maintain their creative expression despite the atmosphere of oppression that surrounded them. It’s a theme that echoes throughout Walker’s work, even in her often-anthologized short story, “Everyday Use.” The other place where I obtained the idea of Emerald’s expression is through the real-life examples of the women artists from Gee’s Bend, Alabama. If you have not seen the documentary The Quiltmakers of Gee’s Bend, you should. Made about ten years ago, this excellent documentary will make you laugh, cry and empathize with these quilters. Descendants of the Pettway plantation, these women have been creating quilts since the beginning of the twentieth century. They still create the quilts by hand, but the artists from the earlier part of the century have been featured in art museums around the world. They had an exhibit in Atlanta in 2006 at the High Museum. The quilters don’t see anything special about their wonderful artistry, but see their pieces of art as a way to keep warm during the piercingly cold Alabama winters. The earlier examples of the quilts are works of art that retail into the thousands of dollars. Their attitude about their artistry is an example for conduct as artists. Art is an expression to please the self and to be purposeful in life. Those who like the art, fine and those who don’t–well, that’s fine as well. I’ll try harder to keep their example in mind. I have even tried to quilt before, but it went horribly wrong. Their attitudes toward their art, as well as their patience in creating the quilts, is exemplary. April is Autism Awareness month. That might not even register on some people’s radars, but my family has lived with Autism for the last 11 years, since my son was diagnosed. My book WHEN YOU ARE MINE releases June 17 and provides a unique opportunity for me to combine my passion for writing and Autism advocacy. I’m donating 25% of my royalties from this book to resourcing families living with Autism. Celebrate all the gladiators out there – kids, adults, families, siblings – living with Autism by entering the Autism Awareness Giveaway! Great cause! Great prizes! Kerris Moreton knows how to make things work. Bounced from foster home to foster home as a kid, she adapted; when opportunity arose, she thrived. Now, about to open her own business and accept a marriage proposal, Kerris is ready to build the life she’s always wanted. The only thing missing? A passionate connection with her would-be fiancé, Cam. Kerris wants to believe that sparks are overrated-until Walsh Bennett lights her up like the Fourth of July. For those of you who haven’t seen The Quiltmakers of Gee’s Bend, I made the link live in my blog post so you can go to ShopPBS.com for it. If you sign up for their mailing list, they will give you a discount on a purchase, I think something like 15%. You won’t regret it. Thanks for this post and the tip about the documentary. I used to quilt years ago and came across a debated point that I wonder if you’ve come across too. I’d read that quilts were used as signals for underground railroad, an idea which appealed to the quilter and the historical writer in me, but it’s a point that was sorely debated and denounced. Have you heard of this controversy? Women’s wash has been used for centuries as a signal. Is it a stretch to imagine quilts would be used that way? Are the scholars who are denouncing this history might not like to think that women would or could be that crafty? I would like to know more about who is doing the denouncing, but if I were you, I would use it as a detail in my work. Thanks for stopping by!